sculpture is an ongoing process in my studio practice. ​working physically with my hands is pure meditation. when pregnant or nursing, a woman doesn't lose her hair. once passed the nursing phase all of the hair that hadn't shed is released, offering the illusion of hair falling out. when this happened to me, i lived in the woods and spread the hair around for the birds to collect for their nests. now i collect hair from cut or brush and form my own nests, integrating moss and lichen like the forest birds. i see so many books become useless. endless publications updated year to year. where this may serve of some importance, updating information, the waste is excessive. 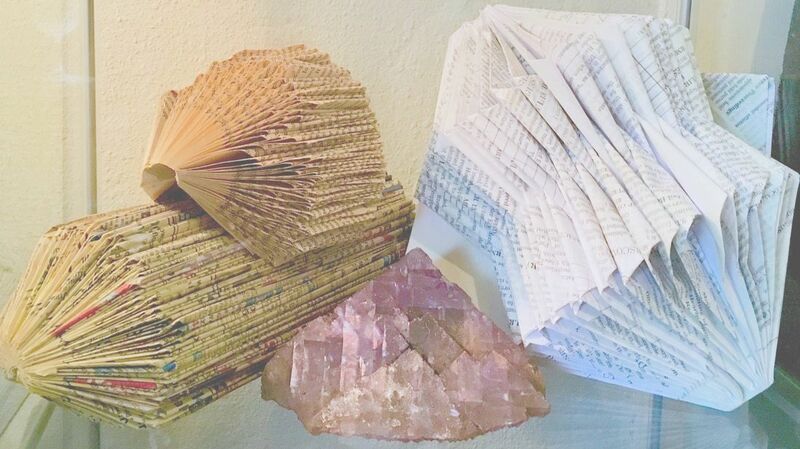 instead of recycling i chose to transform these outdated or discarded publications into folded gems. attractive forms. transmuting our future from waste to thoughtfulness.